This month, you can enjoy Camping Month at Slots Capital Casino with tripled deposits and free spins on slots like Cleopatra's Coins. 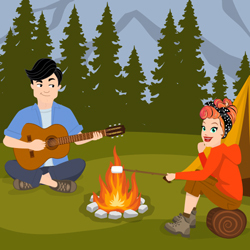 Also this month, Slots Capital's blogger, Slots Lotty, will be sharing her adventures (and misadventures) around the campfire. "Oh yes, summer is here: the sun is shining, birds are singing -- and mosquitoes are biting," chuckled Lotty as she prepares for this month's outdoor adventures. "Camping is a great way to enjoy the great outdoors with friends and family. It's fun, and it's good for you! Why, research shows that people who spend time camping are happier, more relaxed. My research shows they also tend to buy more bug repellent!" Slots Capital, which welcomes players from all over the world, has dozens of unique slot games from Rival Gaming as well as table games like Blackjack and Roulette. The newest is Lucky Labyrinth, a magical slot where there are no dead ends – every spin leads to massive wins with help from wilds, multipliers and special game features. Thanks to laptops, smartphones and tablets, players can even take their slots along on a camping trip. "Just take it from me -- I found out the hard way," Lotty laughed. "A two-man pup tent doesn't include two men or a pup!" Later this month, to celebrate the new Jurassic Park movie, Lotty will go on dinosaur expedition – and find more bonuses. Max deposit $500, no max cash out, 40X rollover. 60 times rollover; no max cash out. Available June 7-14, 2018 only. Cleopatra's Coins is an Egyptian-themed slot where scatters trigger free spins. In its Vases Bonus Round, players choose from several ancient vases to reveal instant prizes.